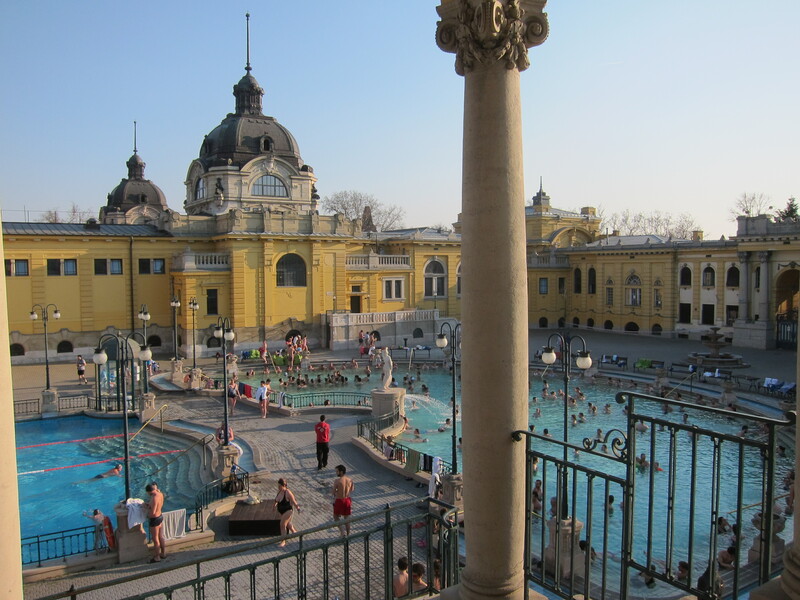 Budapest has 123 natural springs and two dozen thermal baths, which have been enjoyed since the time of the Romans. 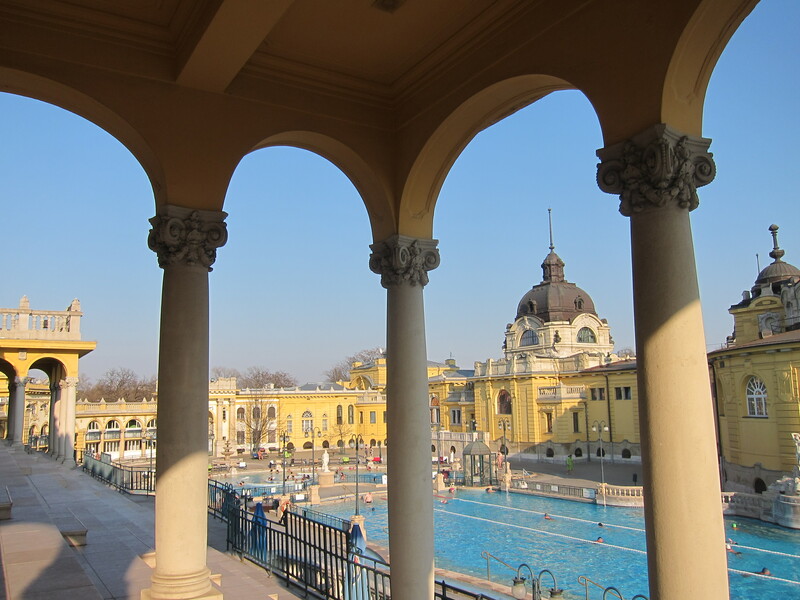 One of the highlights of our trip was the afternoon we spent at the lovely Szechenyi Baths, located in Budapest’s City Park. 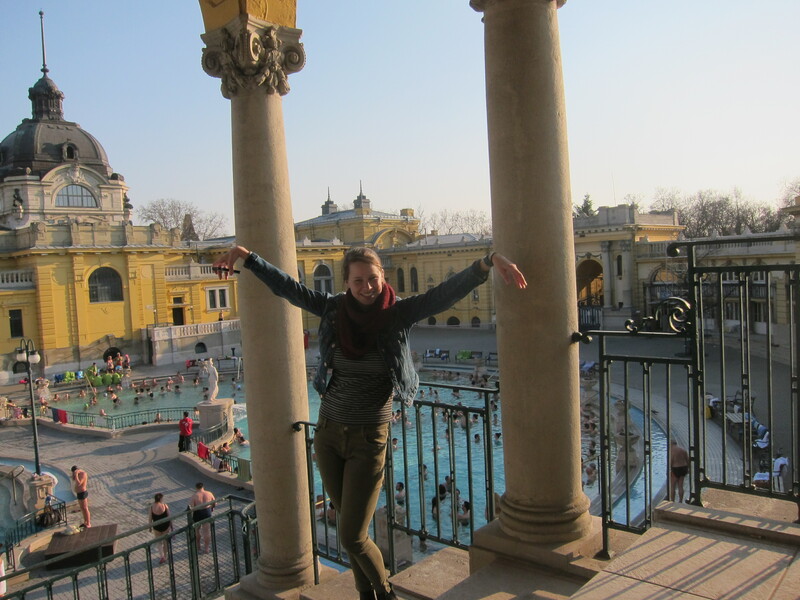 To be honest, we probably would not have been bold enough to go to the baths had Rick Steves not raved about them. 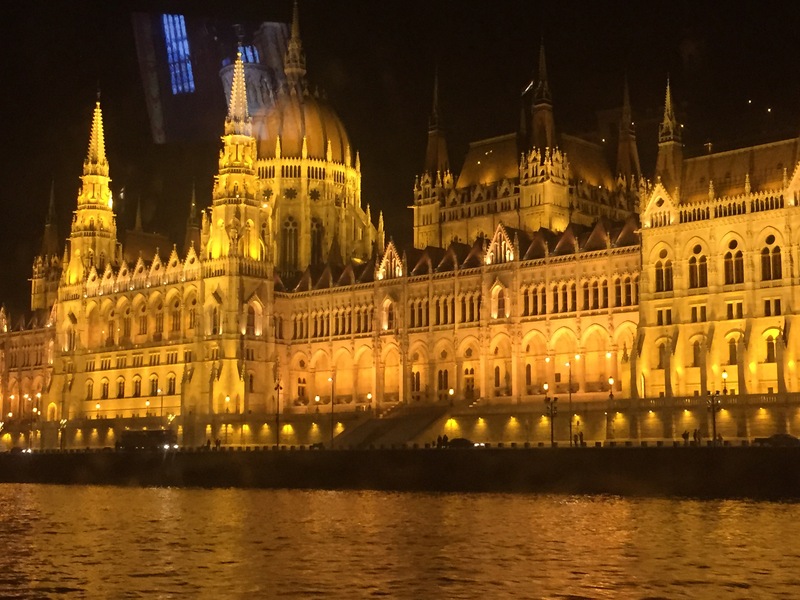 Rick describes them as “the quintessential Budapest experience”, so we really had no choice. The bath building was beautiful. I loved the gold color. Following Rick’s explicit instructions, we entered the building, paid for the baths and a locker, and then found our way to the women’s dressing area. There wasn’t a lot of English being spoken around us, but once in the dressing room we found that we were not the only tourists trying to figure out how everything worked. There are three large pools outside and some thermal baths inside. We stuck with the outdoor pools, which felt perfect in the cool spring air. The pools were divided by temperature from 86 to 100 degrees. They had jets and bubbles and were so comfortable. The people watching was primo, too. The best part was there was no smell of sulphur- just clean, warm, bubbly water. So glad that Rick talked us into going. 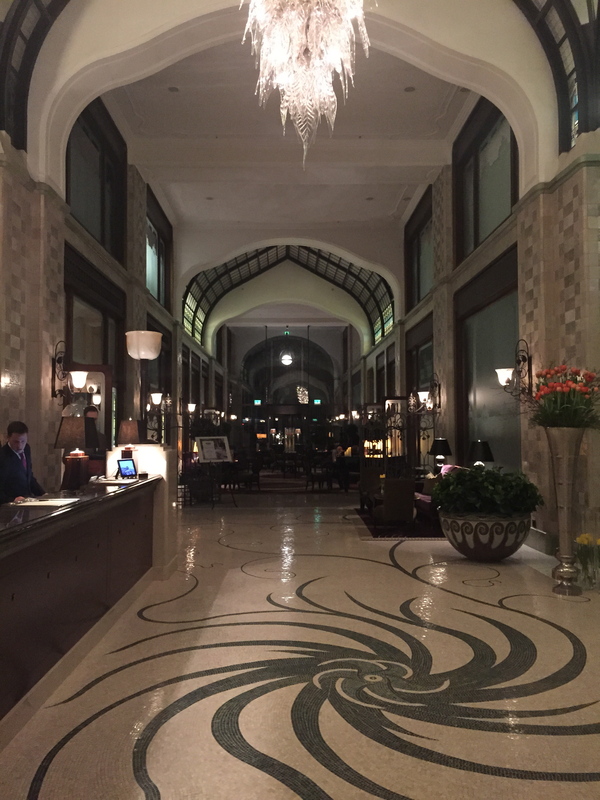 Another nice indulgence, though not nearly as adventurous, was evening cocktails at the Four Seasons Gresham Palace. 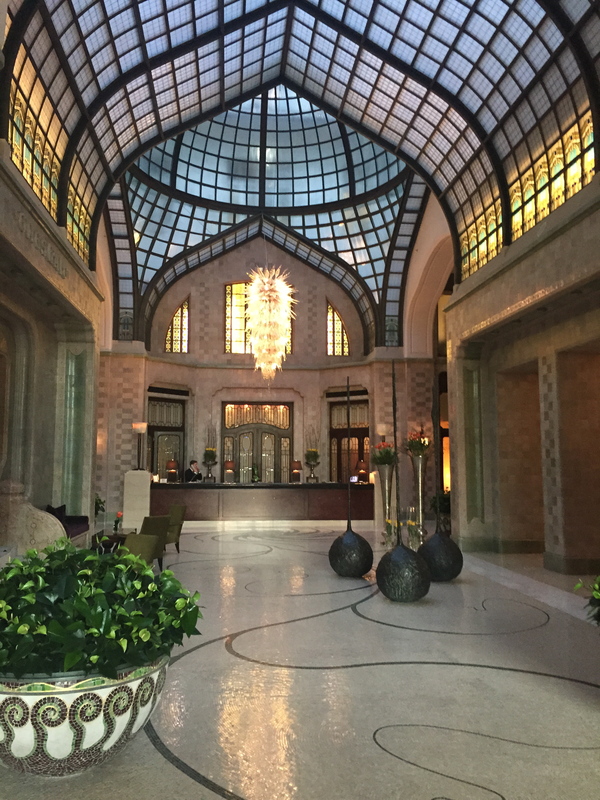 This gorgeous Art Nouveau building has been beautifully restored. We didn’t venture beyond the bar and the bathrooms, but both were really nice. I am so happy I was able to explore this beautiful city with my daughter. Add it to your list, and don’t forget the baths! 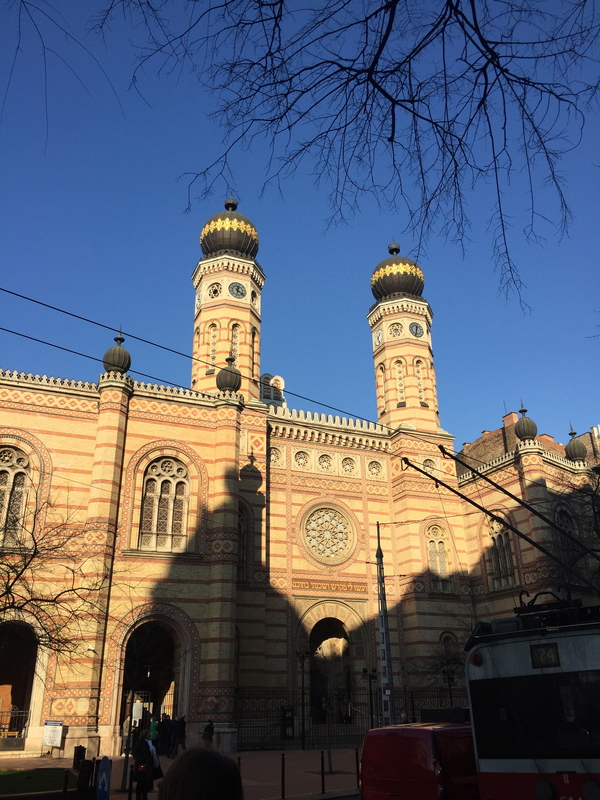 Budapest is home to the largest Jewish synagogue in Europe, and second largest in the world. The Great Synagogue was built in 1857 and was based on the biblical descriptions of the Temple of Solomon, which explains the two towers. 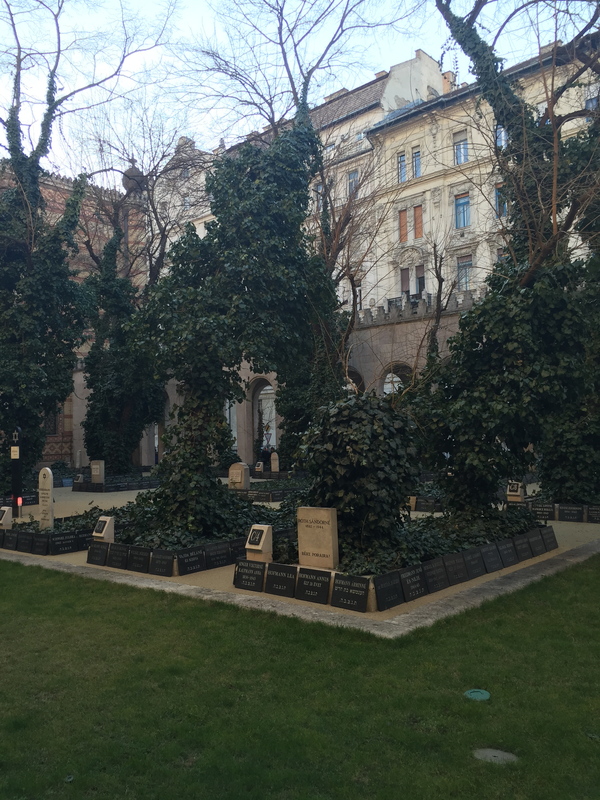 Deterred by the long line to enter the synagogue, we opted instead to visit only the Memorial Garden along side of it. Prior to World War II, 25 percent of Budapest’s population was Jewish. Hungary was the first European country to enforce “Jewish Laws” in the 1920’s. 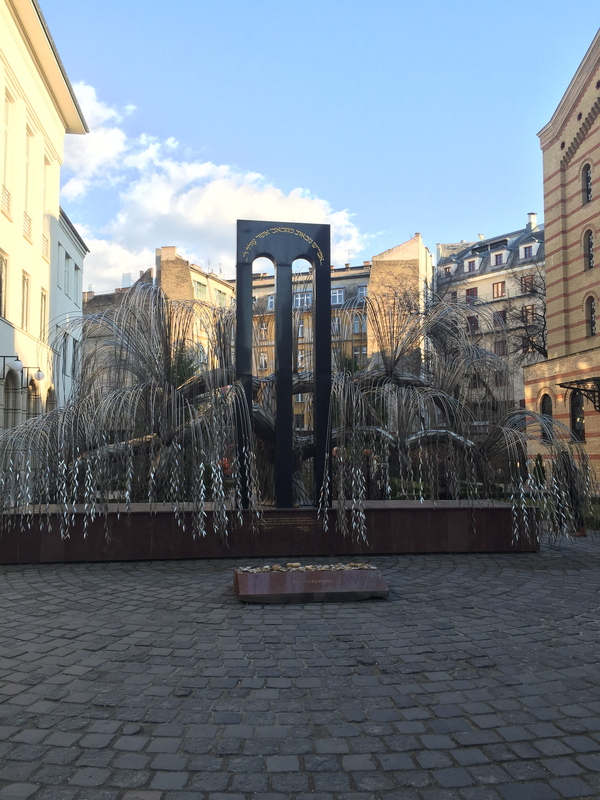 Although aligned with Germany in World War II, Hungary resisted executing its Jewish citizens. Hitler grew impatient and invaded Hungary in 1944. Jews were forced to live in a small walled ghetto surrounding the synagogue and were allowed no contact with the outside world. Within two months, trains full of Jews were heading to Auschwitz. During the Soviet siege that ended the Nazi occupation, many Jews who had not been deported died in this ghetto of starvation, exposure, and disease. Soon after the Soviet liberation, a mass grave was dug here for over 2000 Jews.The trees and headstones were added later. 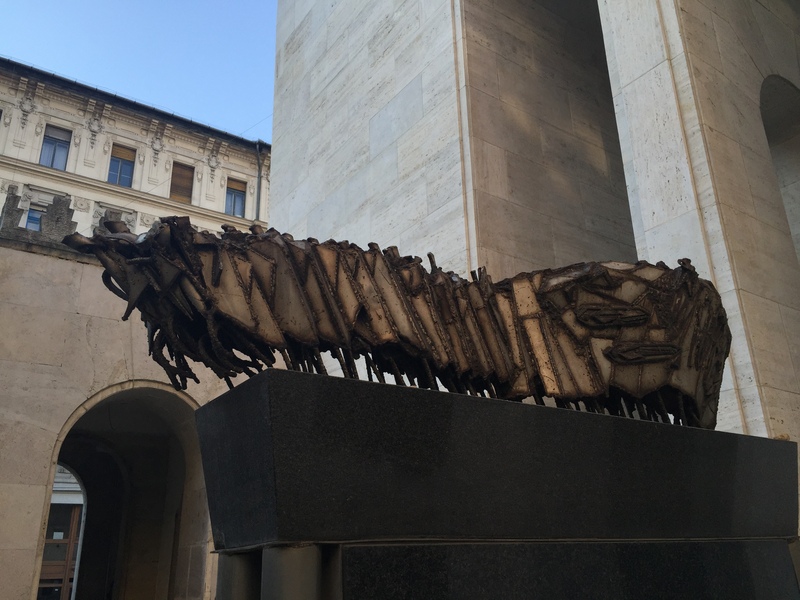 This sculpture represents the forced march of the Jews to death camps. 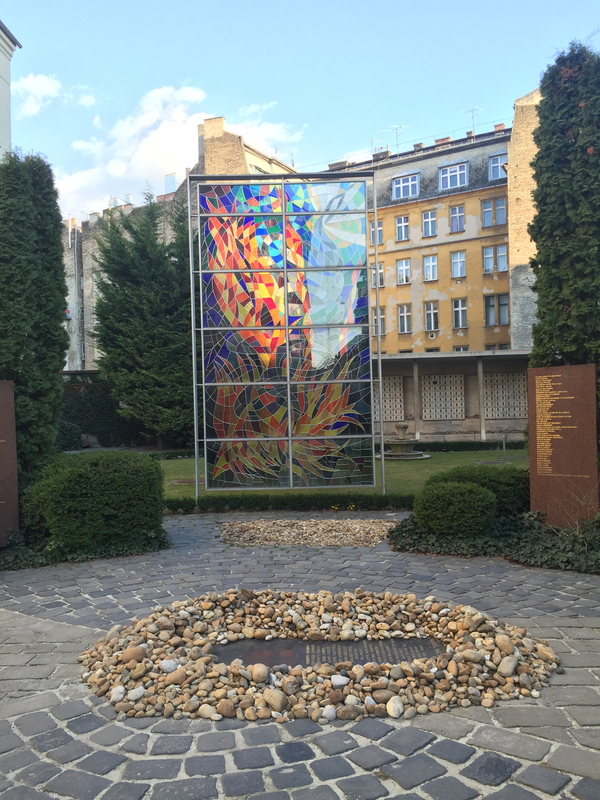 The same sculptor, Imre Varga, created the moving “Tree of Life” in the garden just behind the synagogue. 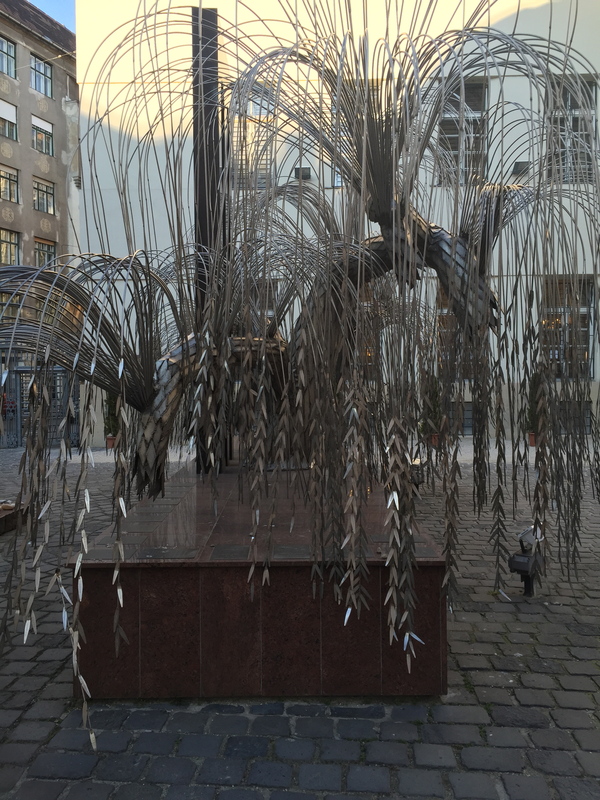 It is a weeping willow in the shape of an upside-down menorah. 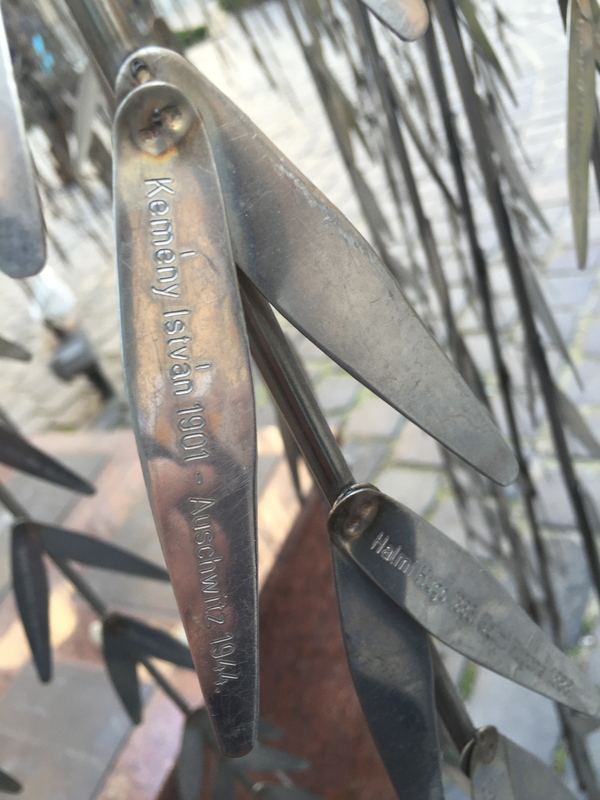 Each metal leaf bears the name of a Holocaust victim. 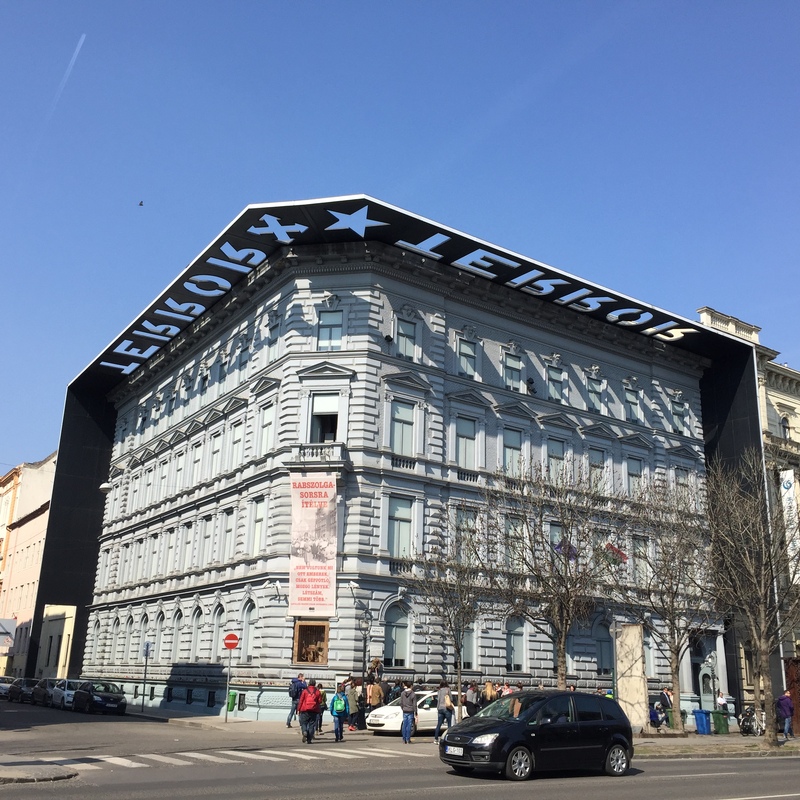 We also toured the “House of Terror”, an excellent museum recounting the terror endured under both the Nazi regime and the Soviet regime. This building was actually the former headquarters of both the Arrow Cross (Nazi-occupied Hungary’s Gestapo) and the AVO/AVH (communist Hungary’s secret police). No photos were allowed inside, but I recommend it to you highly. 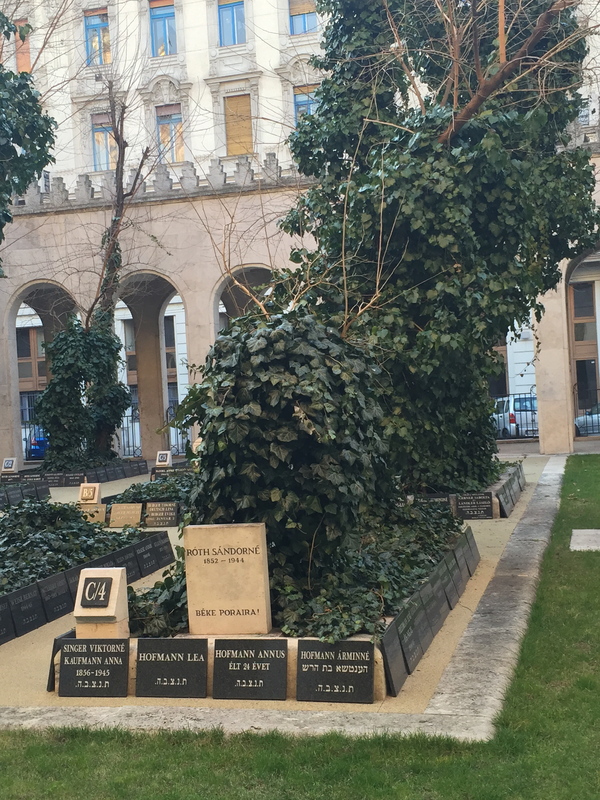 These two visits really heightened our awareness of what a painful and dark recent history Hungary has suffered. Against that backdrop, it was comforting to take an evening boat ride showcasing the enduring beauty of the city. Bonjour again, my faithful friends. My older daughter is spending a semester studying in Madrid, and having a child in my time zone has made me very happy. You know what else made me very happy? Meeting her in Budapest for three glorious days of sightseeing. 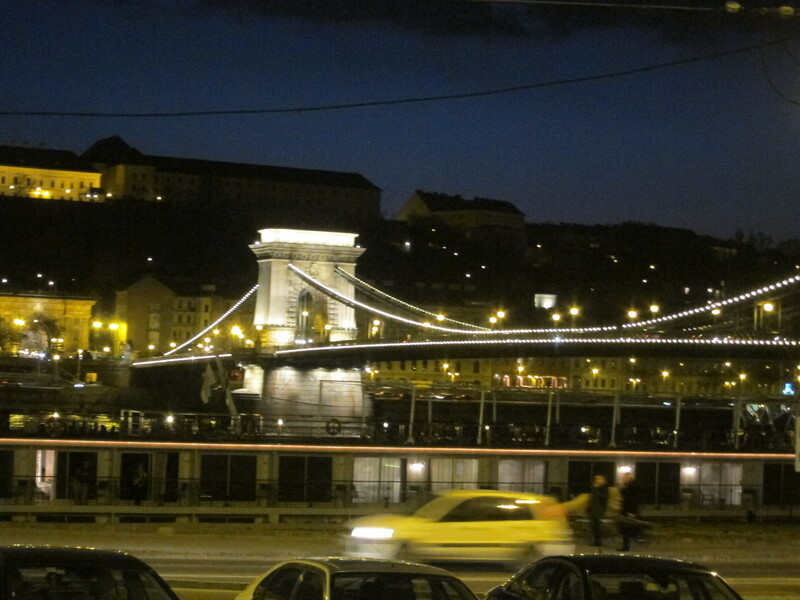 I am not sure why I had relatively low expectations for Budapest. 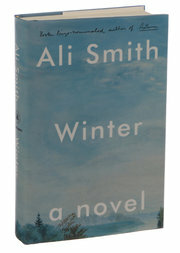 Maybe I had cast it with the dull pall of Communism and thought it would be dingy and in a state of disrepair. How wrong I was. Budapest was beautiful. In many ways it reminded me of Paris. It’s divided by a river (the Danube) and connected by several pretty bridges. The city is built of a creamy white stone similar to that of Paris. Many of the buildings are adorned with pretty carved embellishments like those found on so many Paris structures. Also, there were cafés and coffee houses on almost every street. I felt very much at home. Our first morning we took a three-hour bus (and a little walking) tour with Viator tours. It was a great way to get an overview of the city and figure out how things worked. The first stop on the tour was Heroes’ Square, commissioned to commemorate the country’s 1000th birthday in 1896. This grand square is home to statues of fourteen of Hungary’s most famous leaders. 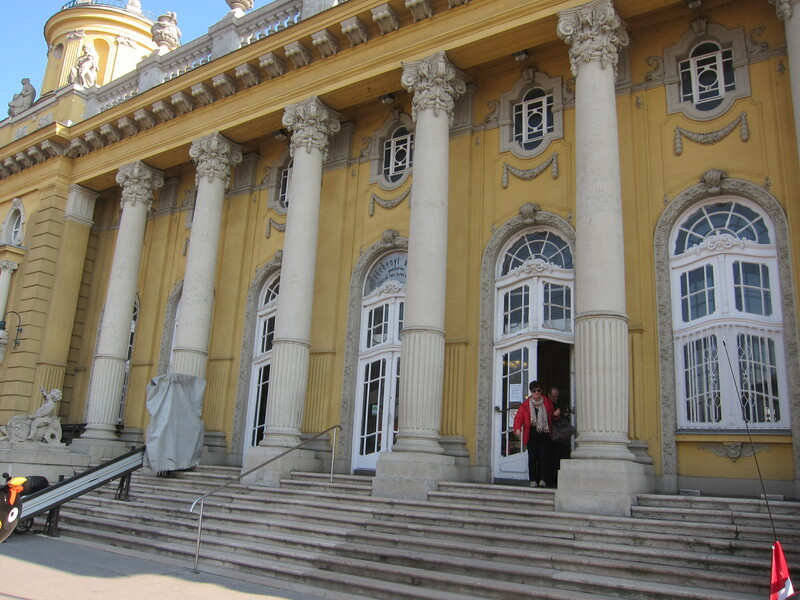 It’s an impressive place, and also marks the entrance to Budapest’s sprawling City Park. Our next stop was a gorgeous hilltop view of the city. 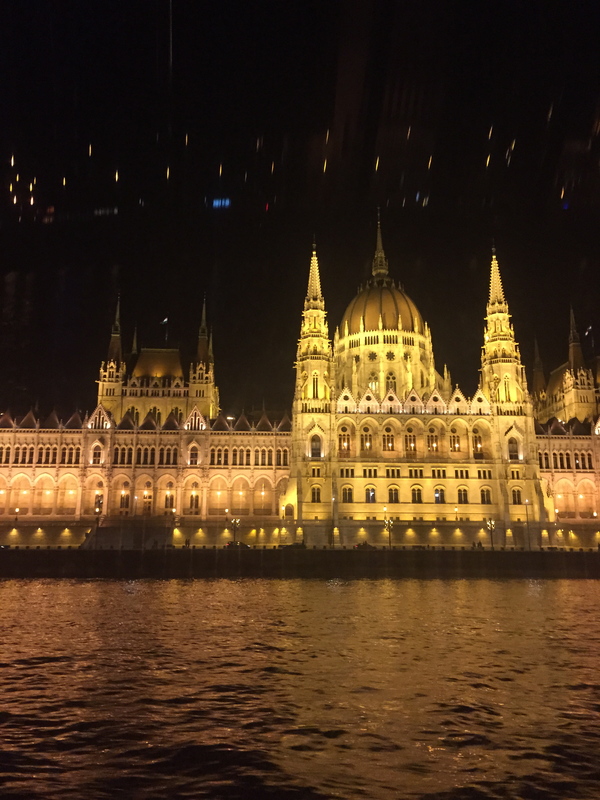 We crossed the river to Buda and walked around the impressive Matthias church, which is next to a beautiful terrace offering more views of the city. After our tour we visited an old covered market which reminded us of the market we liked so much in Madrid. The Great Market Hall is enormous, covering three floors. The ground floor is for produce, meats, and other foods. Upstairs you will find souvenirs and hot food stalls. The cellar is reserved for fish and pickled things. Lots of pickled things. Many of the stalls had been in the same family for generations. Often there was a glass case containing memorabilia of the family’s history in the market. Can you tell we loved the market? It’s well worth a leisurely visit. That’s all for today, folks. Enjoy the rest of your day, and don’t get fooled!